Here is the exclusive Audemars Piguet Royal Oak Offshore Diver's Watch in stainless steel the the vibrant Blue dial. The watch case is crafted from stainless steel measuring 42mm and housing the Calibre 3120 self-winding automatic movement with 60 hours of power reserve and is water resistant up to 300 meters (1000 ft). Beneath the scratch resistant sapphire crystal is the eye catching Blue Méga Tapisserie dial with bar hour markers, the minute hand is yellow and there is a date aperture in the 3 o'clock position. The inner bezel ring is a unidirectional dive timer controlled by the knob at the 10 o'clock position. This watch secured to the wrist on a blue rubber strap with stainless steel tang buckle closure. 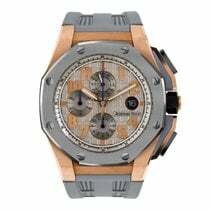 The watch comes with Audemars Piguet box and papers.